Today the piano concerto is one of the most popular genres of orchestral music. The classical and romantic piano concertos belong to the core of the repertoire of symphony orchestras and pianists. It was Johann Sebastian Bach who laid the foundation for this genre. With his seven concertos for harpsichord and strings he was the first in music history to give the keyboard such an important role. His sons followed in his footsteps, and later in the 18th century and the first decades of the 19th others further developed the genre of the keyboard concerto, in particular Mozart and Beethoven. None of Bach's concertos was originally written for the harpsichord. All are arrangements of some kind of concertos previously written, probably during Bach's time in Köthen, where he also wrote his Brandenburg Concertos. There was a specific reason for Bach to make these arrangements. In 1729 he had taken over as director of the Collegium Musicum in Leipzig, founded by Georg Philipp Telemann in 1702. The harpsichord concertos became part of the repertoire of the Collegium Musicum. The performances usually took place in Gottfried Zimmermann's coffee-house or in his gardens. Often Bach's sons were participating in the concerts. The harpsichord concertos have been preserved in one manuscript, which also contains the fragment of an eighth concerto (BWV 1059). It is assumed the manuscript was compiled about 1737-1739, and one may assume it lays down what was played in the previous years. 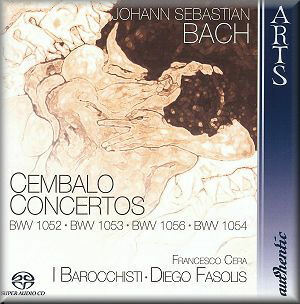 The longest of the harpsichord concertos is the Concerto in d minor (BWV 1052) which opens this disc. It is probably a reworking of a lost violin concerto. According to Gunnar Wiegand in his programme notes Bach used movements from some cantatas here. But it is much more likely that these cantata movements are also reworkings of the same violin concerto. We have the same situation with the Concerto in E (BWV 1053): it goes back to a lost concerto for oboe, and movements from this concerto were transcribed as instrumental movements with obbligato organ in the cantatas 49 and 169. The slow movement of the Concerto in f minor (BWV 1056) also appears in a cantata, as the Sinfonia to Cantata 156, 'Ich steh mit einem Fuß im Grabe'. In its original form this concerto very likely was scored for violin. The Concerto in D (BWV 1054) is the only piece on this disc whose original form has survived: the Concerto for violin, strings and bc in E (BWV 1042), one of Bach's most popular instrumental works. The harpsichord concertos are often numbered among Bach's 'orchestral works', but considering the number of players Bach usually had at his disposal it is more appropriate to describe them as chamber music. They are scored for harpsichord, with two violin parts, a viola part and bass. Only one of the concertos (BWV 1057, not recorded here) has two additional parts for recorders. There is general agreement that it is very unlikely Bach ever used more than two instruments per part; that was the practice in Köthen, and it is unlikely the situation in Leipzig was much different. Furthermore, the fact that the harpsichord and string parts are completely intertwined, and that the keyboard is merely a 'primus inter pares' point into the direction of a very small string band. In these performances three of the four concertos are played with four violins; that should work but here the balance is rather unsatisfying, especially as the ensemble mostly plays very loud. In the Concerto in E no less than seven violins are used. What is the reasoning behind this remains a mystery; the booklet doesn't pay any attention to matters of performance practice. The result is disastrous: the ensemble only produces a lot of noise, and so does Francesco Cera, who needs to couple the manuals of his harpsichord to make himself heard. Just by listening to the various recordings of Bach's harpsichord concertos one has to conclude that the balance between the keyboard and the strings is best served by a performance with one instrument per part. This is how Gustav Leonhardt in his recording of the complete harpsichord concertos has scored his Leonhardt Consort, and Ottavio Dantone has followed in his footsteps in his recent recording of four concertos with his Accademia Bizantina. Another mystery is the use of a 'violino di spalla', which is played by Duilio Galfetti, the leader of the ensemble. Recently much attention has been given to the 'violoncello (or viola) da spalla' which, according to some musicians and musicologists, is the instrument which Bach meant when he scored a part for the cello. New Grove mentions the instrument, but there is no reference to something like the 'violino di spalla'. I assume it is the same instrument as the one I just referred to. But then, if it is used to play the cello part, why is the traditional cello used as well? It is one of the anomalies of this recording, I'm afraid. But the scoring of the ensemble and the volume it produces aren't the only things which are problematic here. Francesco Cera's performance is very straightforward and rhythmically rigid: there is no place for something like rubato which would make the performances much more engrossing. But while doing too little in regard to rubato Cera does too much in regard to ornamentation. There is really no need to add a lot as Bach has written out most of what has to be played. Cera obviously has different ideas: at the end of the first movement of the Concerto in D, for instance, he turns over a whole bin with additional notes. Returning to the ensemble: it isn't only loud and aggressive, it also fails to differentiate its articulation, and Diego Fasolis chooses to largely ignore the dance rhythms. The first movement of the Concerto in f minor comes off best in this regard. The best way to characterise these performances is: much noise, little expression. I really can't find any reason to recommend this disc. And the record company should be embarrassed by misprinting the name of the ensemble on the reverse of the tray: I Barocchisi.